Guest Designer at StencilGirl Talk Today! 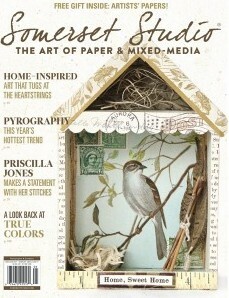 I am so thrilled to be Guest Designer over at StencilGirl Talk today!!! I got to use Pam Carriker's fabulous stencil Bird in Window for a Journal page. 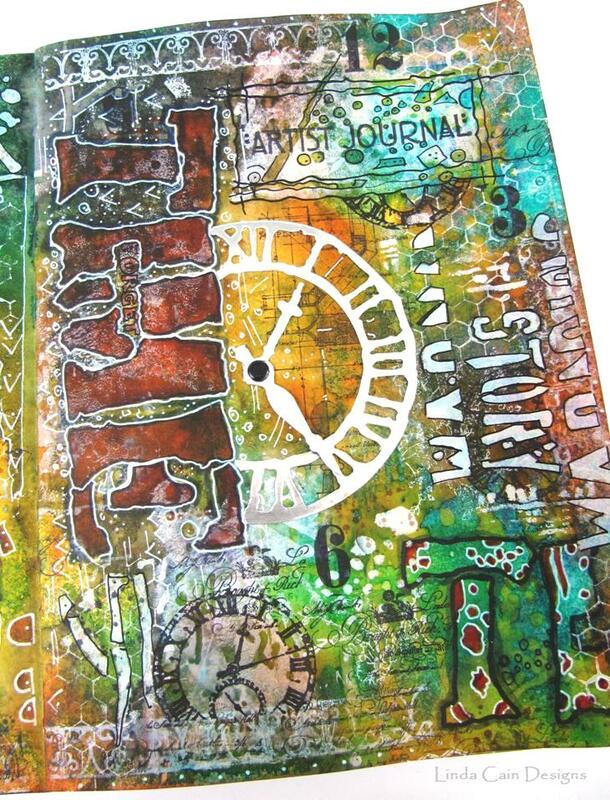 So jump on over to StencilGirl Talk and get some tips on creating this page with Pam's really cool stencil. A StencilGirl Blog Hop Tutorial/Giveaway! Hey everybody! 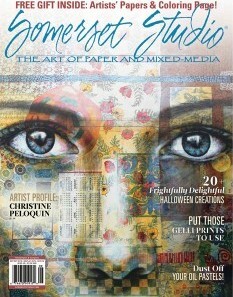 It's time for another StencilGirl Talk Blog Hop! Today I'm using the 6x6 Trivet B Stencil from Cecilia Swatton S167. I started with some Grunge Paste and Fresco Paints from Paper Artsy. I wanted something a little different, so I turned the stencil in a diagonal to the board. I spread a layer of paste on over the stencil onto an 8x8 canvas board and set aside to dry. Then I added several layers of different paints with Cut-n-Dry foam squares. Keep adding colors until you achieve the background colors you like. When dry, sand down areas to reveal lower levels of paint and the white of the paste. I used Archival Inks and stamps to add black and red images to the corner areas. You can see here that I sanded down layers of paint to reveal different colors underneath. I sanded the center area to get the white paste to show. Then I replaced the stencil over the textured area and stamped a large background stamp of a map with archival ink. Then the fun begins with white pen doodles to make the darker colors pop. I added outlines and shadows to the textured area with brush pens. The center needed something, so I embossed a piece of metal with a bingo card set of numbers. Then I added Vintaj Patinas to it, dried it, and sanded it down. It's mounted onto black chipboard and glued to the piece. The last thing I did was cut a piece of black chipboard and add the canvas to it with foam tape strips. It adds another layer of depth. 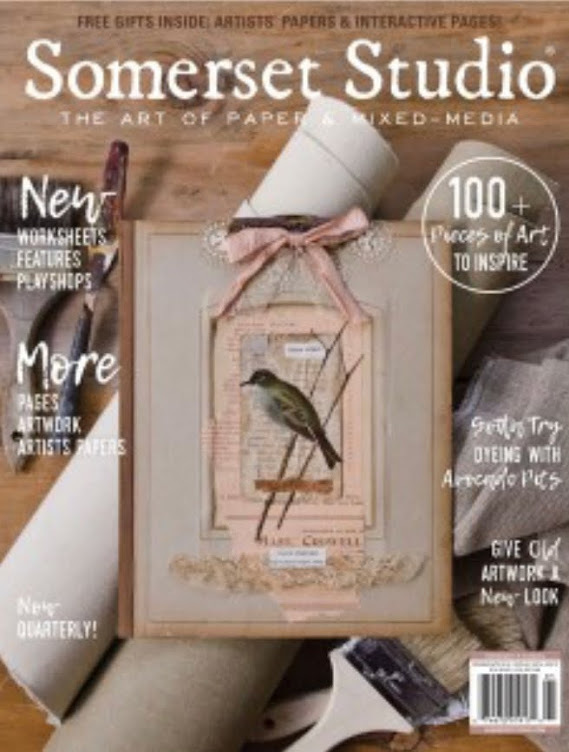 StencilGirl Talk and Cecilia have a giveaway on their blogs. ALL comments in the entire hop are eligible to win. The more blogs you comment on, the more chances you have to WIN! The giveaway will close on Sunday, October 27th at 11:59PM Central Time. That's it for me.....be sure to check out the rest of the Hoppers below and don't forget to leave a comment to win!!! I started out as a Watercolor Artist. I loved learning to create layers of glazes. But when I found stamping and inks....I was hooked. This is a tutorial using 3 different ways to use the new Watercolor Paper from Ranger. I hope you find at least one way you like. This is how I added the 3 different leaves to votive candles I found on vacation. Next I sprayed the paper lightly with water and started adding other colors...such as Fired Brick, Rusty Hinge and Tea Dye. The water lets them blend. I kept adding color and dried with a heat tool, then cut out the leaf when I liked the colors. I added a dotted background stamp with Walnut Stain Distress Ink. This is like an embossing ink, so you can add Gold UTEE to emboss. The gold shows up well on the Redish Orange leaf. Some of the spots did not take the UTEE and remain just dots...that's perfect! The Old Paper Distress Marker adds some shadow. Last I added Vintage Photo Distress Marker to the edges of the leaf. Then the easy part.....using 3 colors of Distress Stains, Ripe Persimmon, Fired Brick and Wild Honey....I swiped them across the leaf. I added shadows and accents with the Pumice Stone Distress Marker. Cut it out leaving a slight border, then edge with the Vintage Photo Marker. Stamp with the dotted background and Iced Spruce Distress Ink......then add Bronze UTEE. 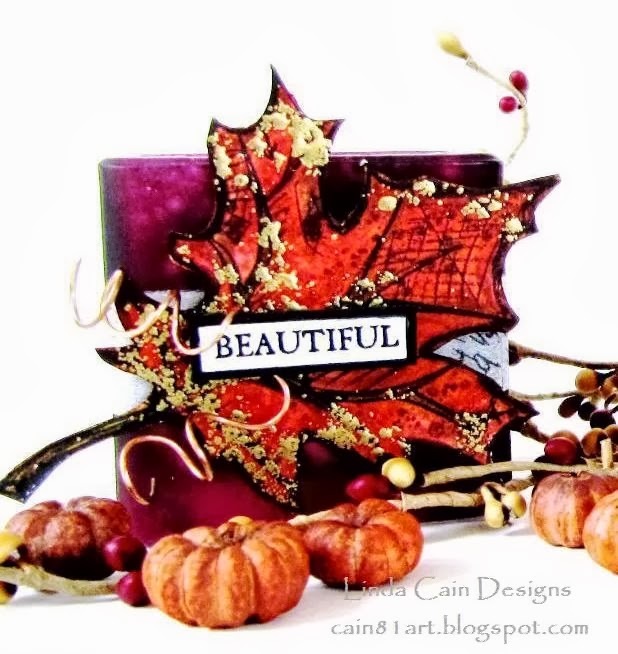 Heat the embossing powder and see the wonderful effects. This is the result of the 2nd leaf. Pretty cool! 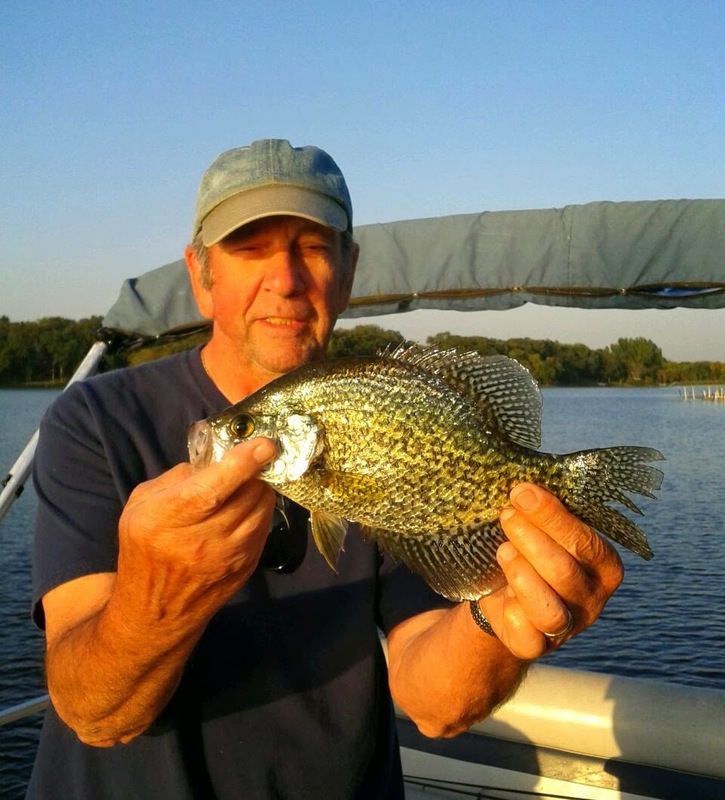 See how some dots have UTEE and some don't. Now the last one is stamped and embossed like leaf #2. Then I added Dylusions sprays...Lemon Zest, Squeezed Orange, Pure Sunshine, and Fresh Lime. This wasn't enough saturated color for me, so I started adding Distress Markers...Mowed Grass and Ripe Persimmon. Next I lightly spray the paper with water. Then I add Mowed Grass Distress Ink to my craft sheet and add more color with a brush. Cut out the leaf and add the Vintage Photo Distress Marker. Stamp with the background stamp and Walnut Distress Ink. Add the Gold UTEE and heat emboss. Here are your 3 different leaves! I found 3 gorgeous votive candles when I was on vacation with silver mirror paint inside. They have a real iridescent quality to them. I'll use the battery candles in these holders. Add a piece of Tissue Tape around the middle of each holder. Then take 3 Vintage Newspaper Words and layer them onto black Chipboard. Wind gold and copper wire around a pen to create 3 accents. 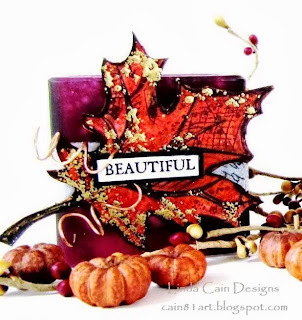 Use black foam squares to add the leaves and words to the votive. I used Mini Pumpkins to lay out on my coffee table. The wire is glued in between 2 small foam squares to keep it steady. 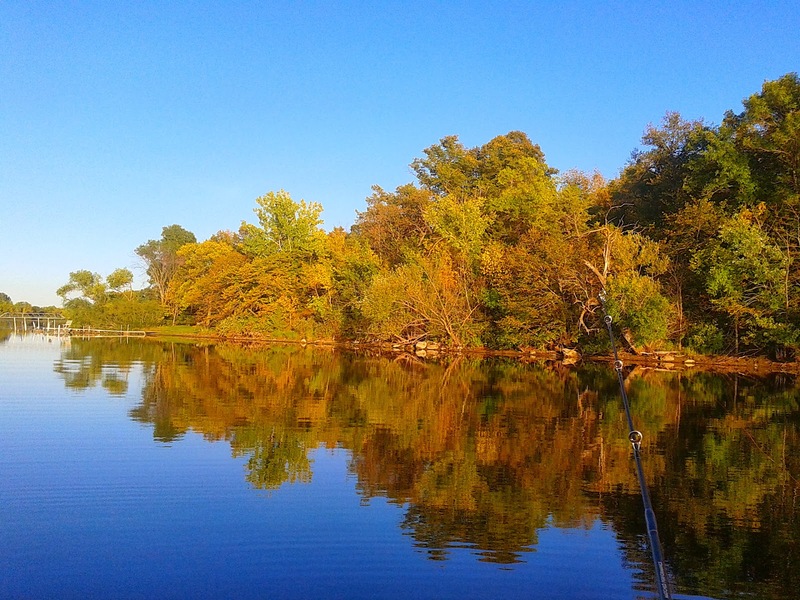 The UTEE is like the little spots I found on the millions of Oak Leaves that we had in our yard when I was a kid. Leaves always remind me of my home as a child. I like the way these turned out! 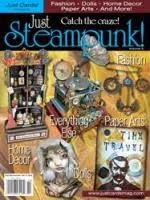 Click on the links to Inspiration Emporium and Retro Cafe Art Gallery for your supplies and accessories. Journaling again and Lovin' it! Hey Everybody, how 'bout another page in a Journal just for fun??? 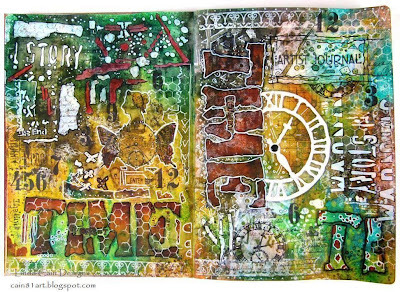 This spread is done in the smaller Journal from Dylusions. I LOVE this size!!! 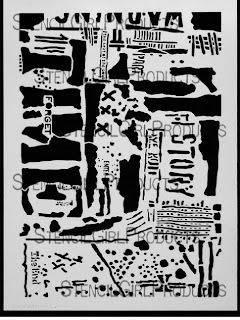 The Stencil is from Terri Stegmiller called Layered Salad S111. It is perfect and you get great bang for your buck with all the different layers. VERY cool! I started with lots of bright colors from the Distress Inks that I added with the Ink Blending Tools. Then I added the Stenciling with darker Distress Inks, Broken China, Dusty Concord and Seedless Preserves around the edges of the pages. I used the fine tip end of Distress Markers to trace bits of the stencil around the interior of the pages. The Numbers here are stamped using Tim Holtz's Numeric set and Jet Black Archival Ink. The shadows make the numbers really stand out!!! 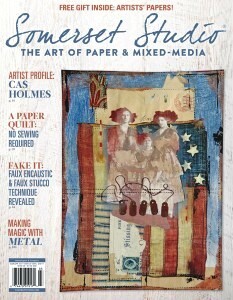 The Mixed Media stamps were added with Mermaid, Snowflake, and Haystack Fresco Paints. The lighter stamped images break up the darker colors. Shadowing is one thing I love to do to images. This part of the Stencil just fascinated me.. I ran it along the bottom and continued it across to the other page. Ink and the Dog Mini stamps from PaperArtsy 22, 48, 56 and 74 are also used around and through the stencil. White and black pen marks are added here and there as well. 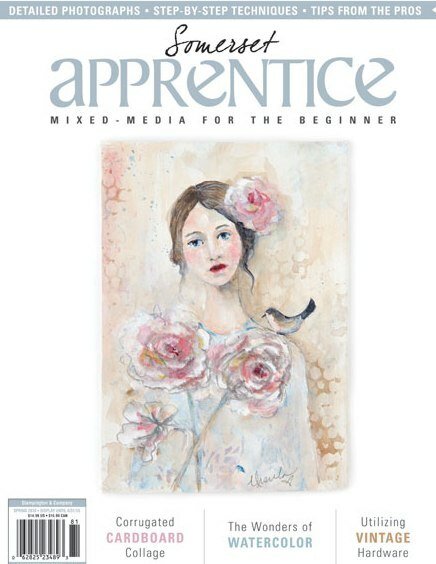 Hope you enjoyed this and it inspires you to create a page of your own! OK....one more tag with the Eroded Metal technique using the Tarnished Brass Distress Paint. I learned so much from CC102 that I'm glad I waited to finish this tag. Here it is embossed with the Cobwebs Texture Fade and then sanded. I used Spiced Marmalade Distress Paint to add a border around black chipboard before I layered the tag onto it. I used the Tinsel Twine and a cool tip from Tim to "age" it a bit. I REALLY love the white Remnant Rubs, too. Embossed and sanded....and then the "white pen" comes out to add some contrast. Eroded Metal Tag from Creative Chemistry 102 with Tim - 2 posts in one day! If you haven't already enrolled in the Creative Chemistry 102 classes with Tim, you should really, really think about it! I can't tell you how to do this technique, but HE can! This is my take on his Eroded Metal ..... is this cool, or WHAT??? Who said a small tag has to REMAIN small??? This starts out as a #5 Manila Tag, but it gets layered and layered to become a larger and more defined tag. I used the Antique Bronze here, and the angled shot shows the metallic shine. I used the Eroded Metal Technique, embossed it, and sanded it down to reveal layers underneath. And thank you Paula Cheney for the idea with the Linen Ribbon in stretching it apart. This is the #8 Manila Tag and Tarnished Brass I did as well...still thinking about what to do with it, but you'll be the first to know, or see. So check out CC102 and "Get your Tim on!" Tim Holtz - Idea-ology - Tissue Tape Laboratory, Industrious Stickers Borders, Linen Ribbon, Collage Keys, Lab Letters, Wire Pins and Sanding Grip. Tim Holtz - Distress Paints - Antique Bronze, Broken China, Fired Brick, Tarnished Brass, and Brushed Pewter. Tim Holtz - Distress Stains - Fired Brick and Festive Berries. 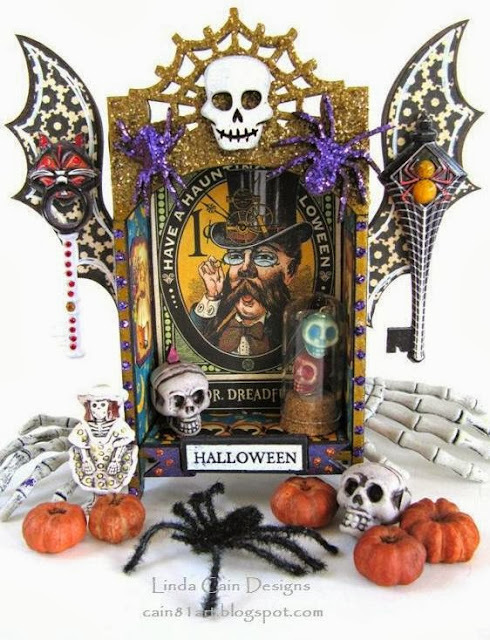 Here is a fun little Halloween Hutch from Retro Cafe Art Gallery. It has the Bat Wings in the Kit and you can see it at the link below. I used papers and paint and the new Tarnished Brass Distress Glitter from Tim Holtz on the Spider Web at the top, and Purple Ice Stickles on the Spiders. You can find all the rest of these fun pieces at RCA, except the larger plastic skulls....I found those little treasures last week at Crafts Direct in Minnesota when we were on vacation. And I used 12x12 Graphic 45 Steampunk Spells papers and a few things from Happy Haunting stickers sheets in my project, but Kristin has the whole Steampunk Spells 8x8 paper pads! One of my favorite collections to date! I love the new little Ceramic Skull beads in the Corked Dome, too cool! And check out that little Catrina Ceramic bead in the lower left. This is the back where I used a Chipboard Die Cut from G45 to sign my little Work of Art. The magic word here is SALE.....lots of things are on sale and going fast. Check the sale items here. AND Sharpie Water Based Poster Pens!!!! 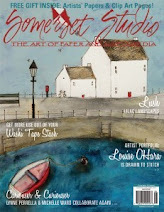 THE BEST white pen for so many things from Journaling to Mixed Media....and Kristin has them!!! So I'll bore you with a few vacation pictures....ha! 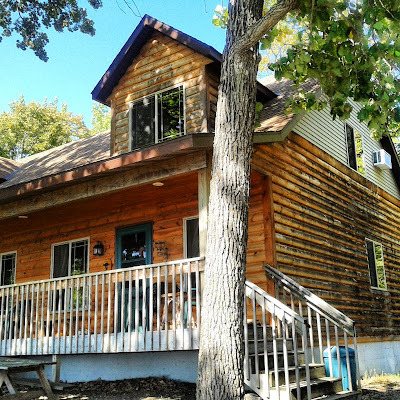 This is the cabin we stay in on Horseshoe Lake by Richmond, MN. I have the loft upstairs with the dormer window to set out my art supplies to play. I took this the first night we were there....serene beauty near sunset. This was from our boat on the last night going in. And this, though it may not look big for a fish, is really a good size Crappie that I caught, about a 1 1/2 lbs. Bill holds it because you're not seeing me with my hand holding him. I'll take them off with gloves, but that's it! I am so thrilled to be over on the StencilGirl Talk blog today using a Seth Apter Stencil to create a multi-layered Journal Page. I LOVE how this turned out with the Metal Foil Die Cut Clock!!! This is the open Journal. 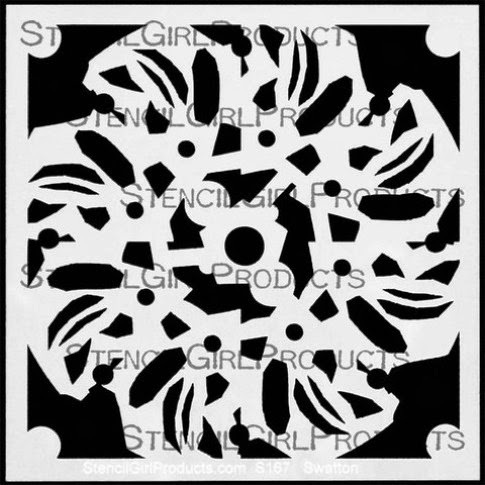 I'm using this stencil from Seth - L183. It has soooo many possibilities!!! So jump on over there and I'll take you through this fun project.